While C_TEC represents true technology companies—large and small, mature and startups, traditional and Internet based—it also serves as a bridge and gateway to the many other sectors that use technology, and where appropriate, brings providers and users together to advocate effectively on core issues of mutual concern. The Chamber's vast network and convening power is increasingly valuable to our members who need policy leadership and certainty to grow their business. C_TEC is uniquely positioned to expand the story of other advocacy groups by aligning the voices of traditional and non-traditional companies. C_TEC will engage Technology Leaders and their teams. This approach will broaden the definition of what it means to be a technology company and what technology policy means for companies. For startups, we offer our policy experience and relationships with all levels of government. This allows startups to continue to focus on technology, development, and business growth while we focus on creating the best possible legislative and regulatory environment for them to thrive. Broad-based business issues from labor to healthcare are relevant to technology companies. In order to effectively communicate with and advocate for this sector, C_TEC assists policy efforts underway and provides a platform to address new issues that resonate with technologists and innovators. 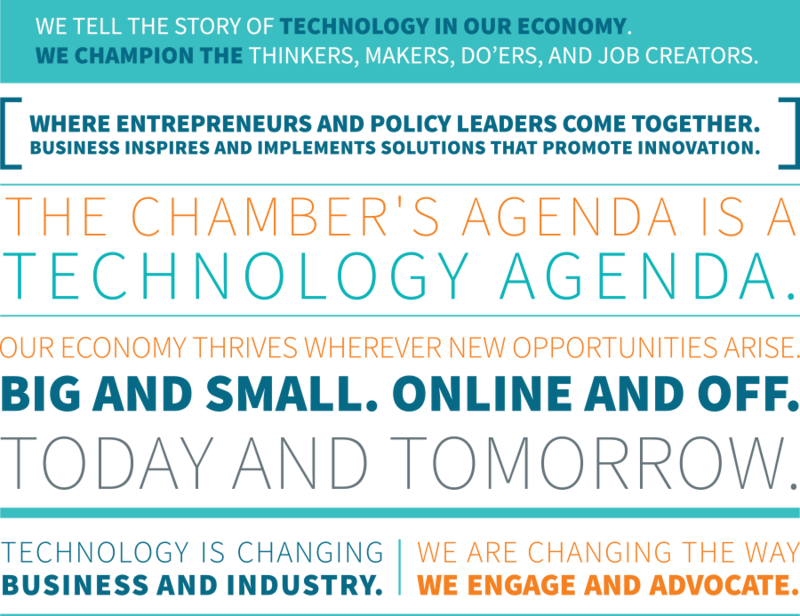 The U.S. Chamber’s Jobs and Growth Agenda is just as relevant to technology companies as it is to non-tech companies. By working together where appropriate, coalitions will be stronger and more effective. C_TEC will target select cities with medium to large populations of technology businesses to analyze their environment. In addition to speaking with businesses, we will look at state legislation, the presence of universities and venture capital firms, and measure a series of variables to expand upon ‘Innovation that Matters’, a study jointly sponsored by 1776, the U.S. Chamber of Commerce Foundation and FreeEnterprise.com to create a blueprint for city and state leaders. Ultimately, this study will provide them with the ability to build their own technology ecosystem to help drive the local economy and create jobs. Convene local chambers with business, policy makers, entrepreneurs, and stakeholders. Facilitate an open dialogue about the benefits of an innovation ecosystem. Educate and inform the above audience on data and current conditions to continue a conversation about the future. Promote an environment that brings together private and public sector stakeholders to participate in the dialogue about the value of innovation and data. Advocate and lead the national public policy debate surrounding these best practices to stimulate innovation ecosystems that will spur growth and opportunity across America. The Chamber already serves technology companies in nearly every division. C_TEC leverages existing work that is relevant to the tech sector and technologists to amplify its impact on policy makers and thought leaders. The Center is currently focused on issues that don’t divide political parties in a significant way. Rather, it is focused on areas where C_TEC can define the issue, deliver value for members, and have a meaningful role in driving the debate. We're the storyteller of American ingenuity, promoting the importance of technology and innovation to the overall economy and job creation. C_TEC's bipartisan message supports innovation, research and development, and technology growth. But our narrative in Washington is only half the battle. we can drill down to the core issues that affect everyone's ability to innovate and advocate for a stronger future. C_TEC authored op-eds, blog posts and reports allow us to tell the story of the emerging technologies that are important to our members. Additionally, our team speaks at events around the country to reach a larger audience. We also publish a monthly newsletter to update on members on all things C_TEC. C_TEC hosts commissioners from the FTC, FCC, and other regulatory agencies to speak to the business community at the Chamber providing our member companies the opportunity to build relationships and have "off the record" meetings with these policy makers. Our unparalleled access allows for mutual understanding. Policy and regulatory issues don't just occur inside the beltway. That’s why C_TEC sponsors a series of signature events in cities across the U.S. to engage with local businesses of all sectors that rely on technology. C_TEC also works with our state and local chambers networks or partners to hold panel discussions on our priority issue areas. C_TEC will host distinguished executives speaking to diverse audiences at the U.S. Chamber Headquarters in Washington, DC. Our goal is to convene experts and dreamers to give talks that are idea-focused, not only on the outlook of their respective companies but on the future of technology and its role in the world around us. We would like for the subject matter to revolve around what our speakers are passionate about because the objective of this series is to hear from YOU. As new technologies continue to emerge and change, there is a growing need to educate members of Congress and their staff about how these innovations can better our lives and create jobs. C_TEC will convene key industry leaders with members of congress for open, two-way, round table discussions so that information can be shared freely and a better understanding can be obtained. This annual event is made up of keynotes, panel discussions, and demos to bring together business leaders, policymakers, innovators, and students to delve into the most important subjects in the world of technology. This is an opportunity for our members to share their ideas and showcase their businesses. These senior-level advisors offer direction and work with our staff to ensure that our objectives are set to deliver the best results for our members. The Advisory Board is made up of a diverse roster of businesses that reflects C_TEC’s members. The Chamber has affiliates in every state and major city across the United States. C_TEC’s Tech Council connects us with the individual in each location that handles technology policy in order to create a network to track legislation at the state and local levels, strategize, and, when appropriate, provides a force to mobilize in order to address issues that affect our members. Other organizations are already doing a lot of notable work in this space. C_TEC actively coordinates and partners with these groups and trade associations to maximize our impact and work in the sector.